In April 2015, when we did the Out of Soil project at the Friedrich Ebert Stiftung in Berlin, Dr Vandana Shiva invited us to India. Supported by the ifa foundation, we went there in late September and participated in Bhoomi, the festival of the living soil in Delhi. 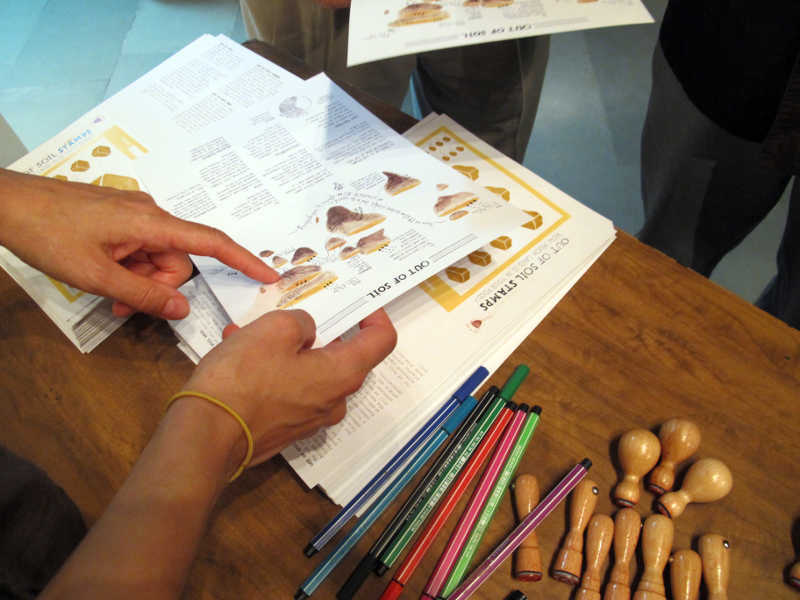 We also ran two workshops as an extension to the original Out of Soil project. The first part of our trip took us to the Navdanya farm in Dehradun, which is a rural region north of Delhi. Navdanya is an organisation, which is founded by Vandana Shiva for conserving seeds, biodiversity, culture and farming knowledge. People with different backgrounds come from India and all over the world to this farm to learn about sustainable agriculture. When we arrived, we joined the final days of the A-Z seminar of eco-agriculture, a 4-weeks course that provides hands-on knowledge about organic farming and biodiversity. 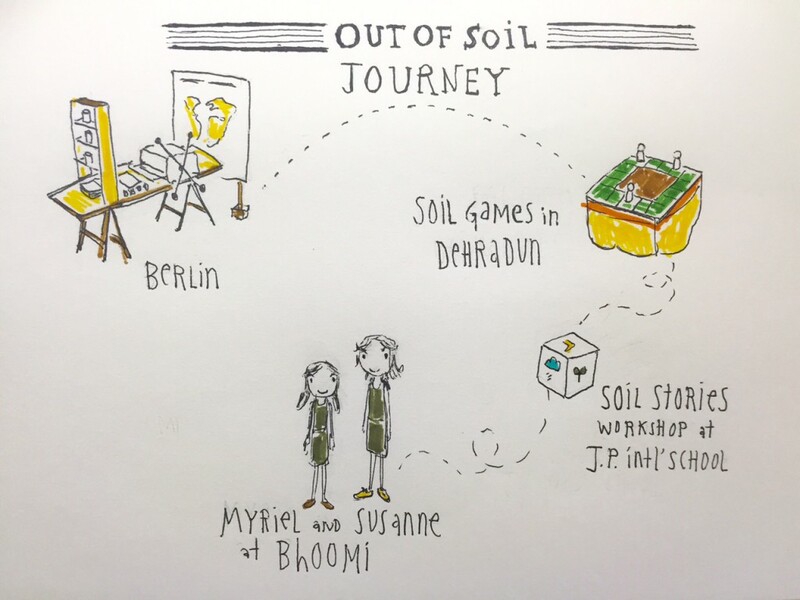 Together with seminar participants, we held our first workshop on Soil Games. We started out with the question: what would soil say if it could speak? Discussing this in pairs of two, people wrote down their personal slogans and attached them to their garments. After a mapping of soil topics and game types, we drew possible connections between the two areas. 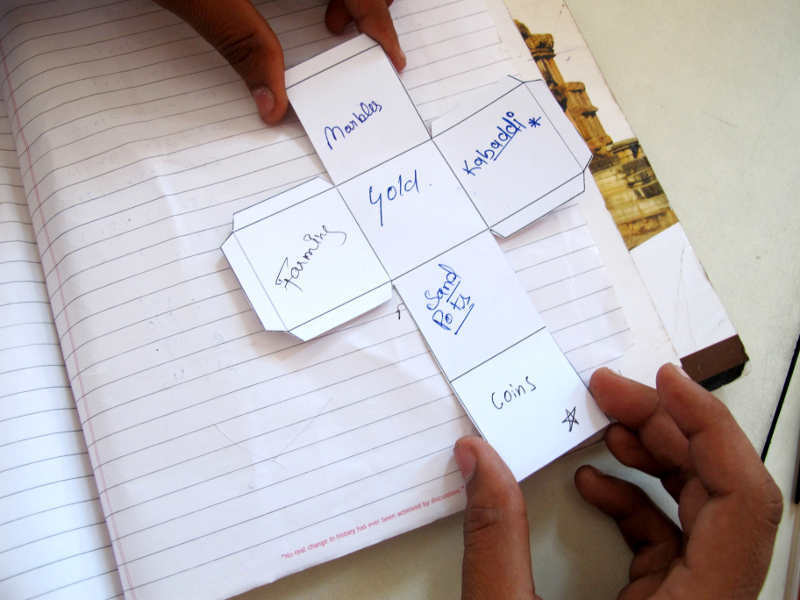 In small groups, people started quickly developing ideas for soil games and sketching them out on big sheets of paper. 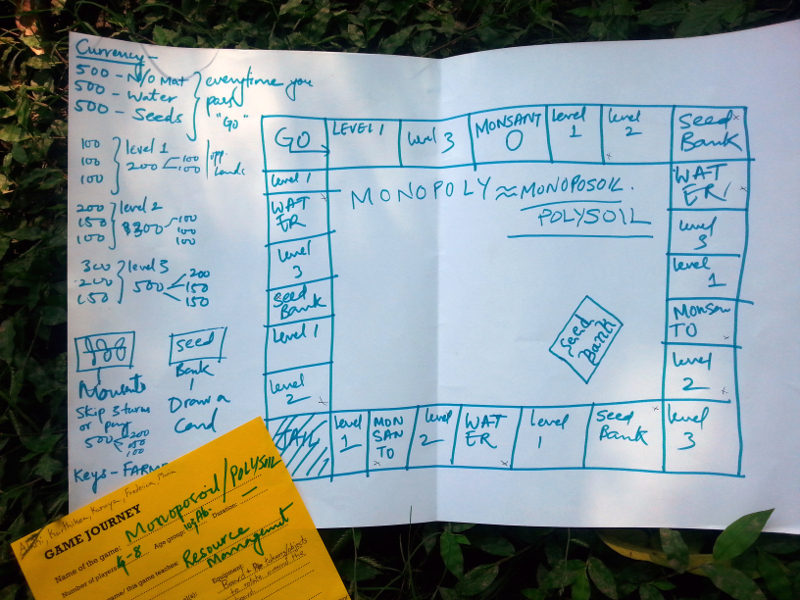 In the end, they created about seven different concepts of soil games, ranging from a simple memory game to a very complex variation of Monopoly called “Monoposoil/Soilpoly”. As players enjoy growing their fields in the game, they learn about the consequences of capitalistic agriculture and their choices on organic or non-organic cultivation. 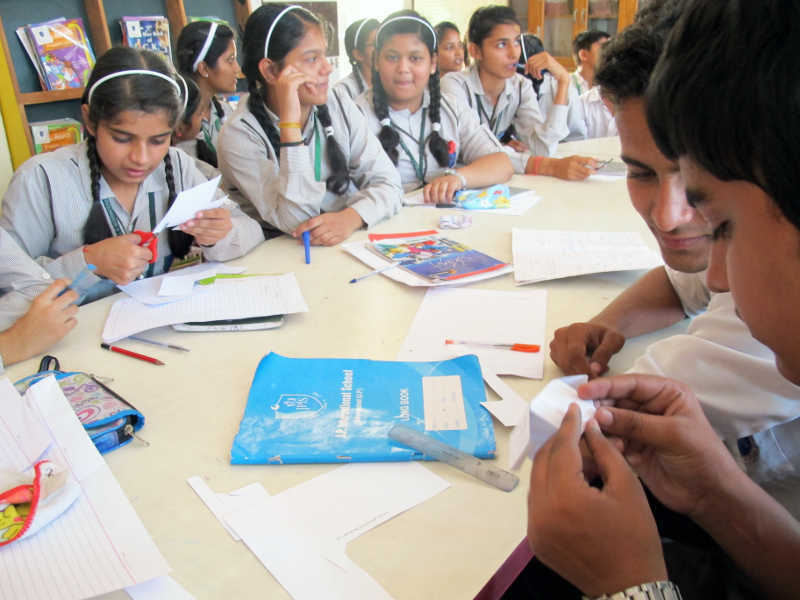 We also ran a Soil Stories workshop with students at J.P. International School in Muradabad, Uttar Pradesh. 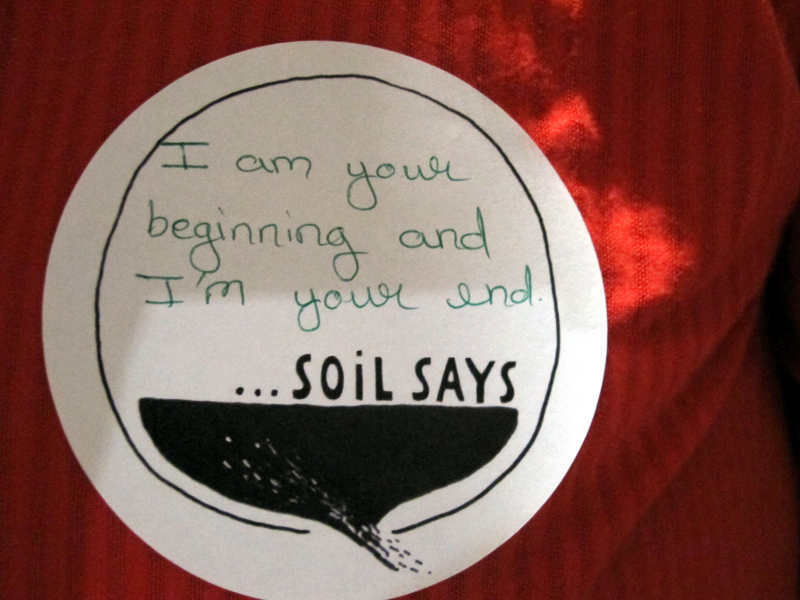 Working with 82 teenagers within a very limited amount of time, we focused on creating soil related narratives. 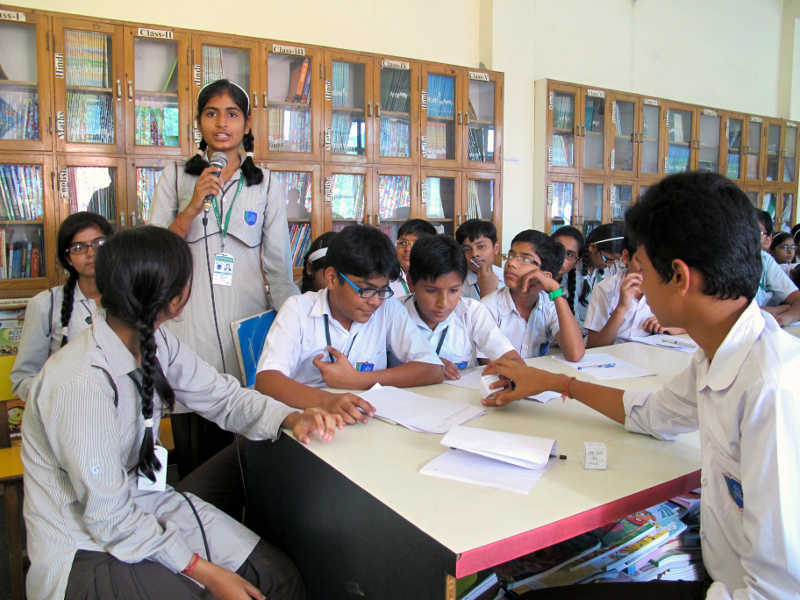 Muradabad is a small rural town where most families farm, so most kids have a connection to soil – which also became apparent when we invited the students to share their personal stories dealing with soil. 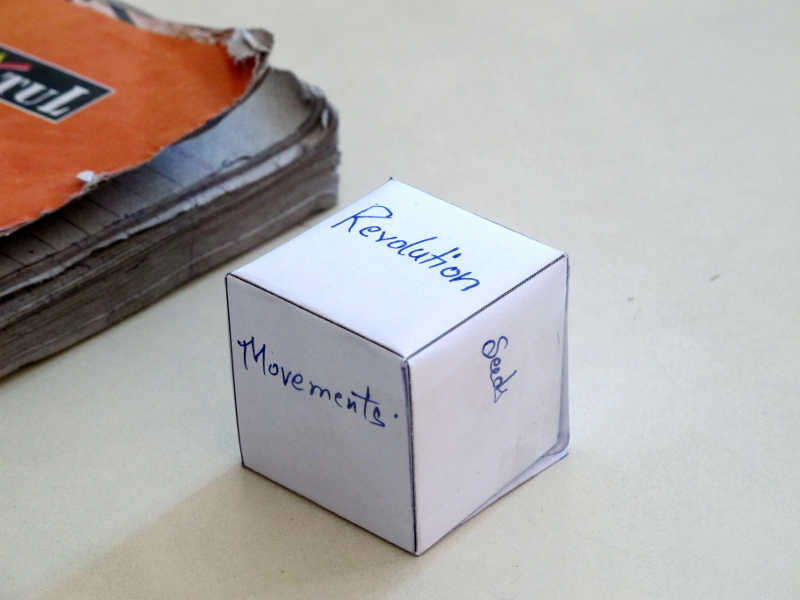 In groups of five they created one story cube, by combining key elements of their own stories with terms from our introduction into the topic or elements of myths and legends. This resulted in fifteen story cubes that were amazingly rich in associations and ideas. One group after another threw their dice. Depending on the words displayed, the kids invented a part of a story that was to be continued by the following group. 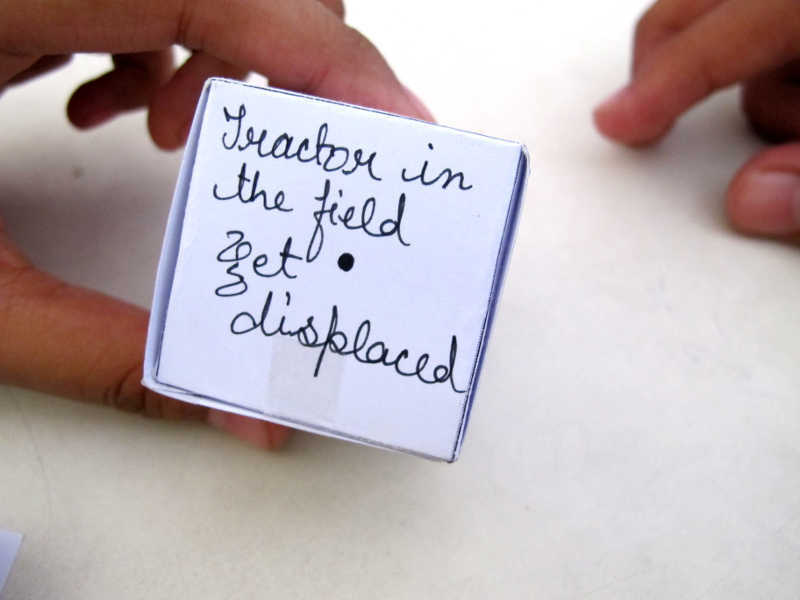 Since the time was limited, we could not explore the full narrative potential of the story cubes during the workshop, but we could see that they would work very well both as a creative method of story telling and as an inspiration for the kids to think about soil in an unusual and fun way. The last stop on our Out of Soil journey was the Bhoomi festival in Delhi. Being half conference, half festival, Bhoomi is an event that celebrates the living soil, and this year it brought together 20 speakers and performers from around the world. More than 250 people attended the event that took place at the International Conference Centre in the heart of New Delhi. 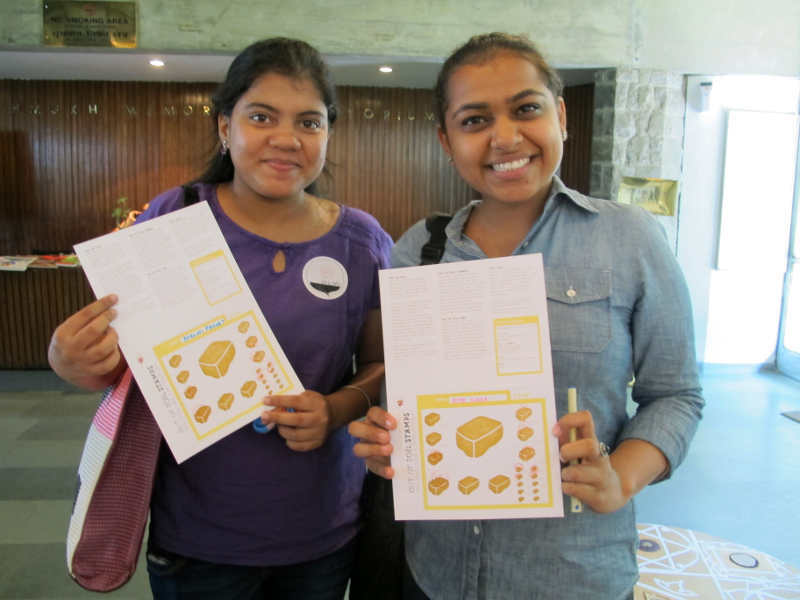 We set up a scaled-down version of the Soil Press Station, comprising Out Of Soil Stamps with information specifically relevant to India, ‘Soil says’ stickers, and the world map. During the one-day event we spoke with many people, handed out the stickers for them to fill in and wear, and stamped the Soil Stamps in order to assess people’s personal land footprint. The conversations we had with the visitors often centred on the issue of food consumption, and we got the impression that most people we talked to are naturally very conscious of their diet and its relation to soil and health. Again, the ambiguity of the project—looking like an info booth of an NGO at first glance, but being an artistic participatory project—generated a lot of curiosity about our background and intention. The playfulness of the project levelled the potential threshold and allowed for a very diverse audience to engage in an open discussion about who has the right to land, how land is used and what it takes to preserve fertile grounds for the livelihoods of people.